Marshall Seaver is looking forward to a summer of fun and relaxation, but it's not off to a great start. His widowed father has left him home alone while he travels to Las Vegas on business, and he got into a fight with his best (and only) friend Cooper right before Cooper left to go with his family to their lake house. So at first, the strange occurrences in his house late at night just freak Marsh out. But when he is faced with Gravedigger--a character Marsh created in his drawings--who is alive, real, and intent on killing him while mumbling about Morpheus Road, Marsh heads straight to Cooper, with the help of Coop's older sister Sydney. But by the time Marsh gets to the lake house, Cooper is missing, and it's becoming clear that nowhere is safe for Marsh, Sydney, and anyone else that knows about Gravedigger and the mysterious Morpheus Road. D.J. MacHale's The Light, the first book in the Morpheus Road trilogy, is a bit slow to start, but full of near-death action sequences and plenty of sleuthing. The book starts off with the main character, Marsh, talking rather ambiguously about the events of the previous week, which he then details as the book starts, which will grab your attention and cause you to start asking questions right away. However, Marsh has a tendency to ramble as he is trying to figure out the many mysterious supernatural forces at work, which might lose more reluctant readers. 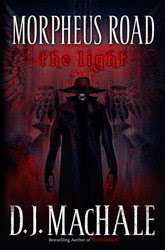 As far as plots go, this one is complicated and asks many questions without divulging many questions (for example, it is never revealed what Morpheus Road is exactly), and The Light reads like a horror film, with the threat of death around every corner and countless spooky and perilous scenes, one right after another. The ending has a bit of a twist, and concludes with many questions and an epilogue from Cooper's point of view, a taste of what is to come in the sequel. Overall, this is a thrilling horror read that will have you on edge. Cover Comments: The cover definitely matches the book's content: chilling and freaky. Exactly what I would expect to see on a movie poster for a horror movie. It's very fitting. The Light will be available on April 20th, 2010. I am a huge DJ MacHale fan, and am really looking forward to this, for I want to see how different this is from the Pendragon Series.